I have attached a file. I three sections manually drawn, so I created dummy boreholes based on a GRID and I am trying create a stratigraphy model but because of the dipping lithologies, i decided to break the units into sections. The problem is the grids overlap each other, i am not sure how to clip them and stop them at the next layer because they are dipping. I tried the isopach method in the case studies but it does not work because the top and bases of one "thickness" do not have the same extent so it creates artefacts at the edges. The RockWorks Stratigraphy model requires that the formations do not repeat vertically and that they are in the same order. It looks like your intrusives cross the pre-existing formations at different levels in some cases so they cannot be modeled automatically as Stratigraphy unless you break the DOL units into smaller units that preserve the constant order requirement. In addition, be sure to add depth picks in each borehole for each formation, even if it has zero-thickness at that location. 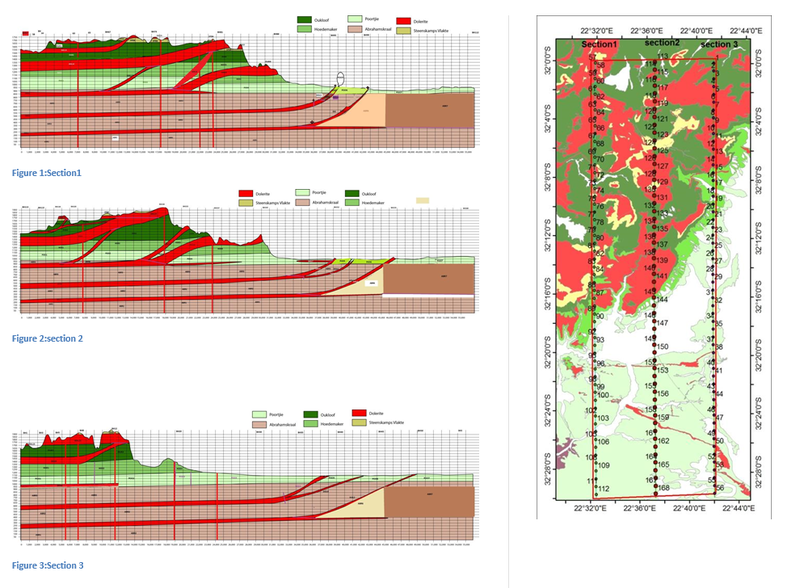 You can create the Stratigraphy grid files one unit at a time to fine tune the process. Use the RockWorks naming convention unit_Top.RwGrd and unit_Base.RwGrd to display all the grids in a Stratigraphy model diagram. You may have better luck modeling these sections as Lithology, since the Lithology model allows repeated units in the vertical dimension. Thanks for the response, I will try to add the zero thickness in the borehole and also try the grid filtering to make each layer at a time and see how it turns out. I do not like the lithology loo. It requires some trial and error.